A T cell, or T lymphocyte, is a type of lymphocyte (a subtype of white blood cell) that plays a central role in cell-mediated immunity. 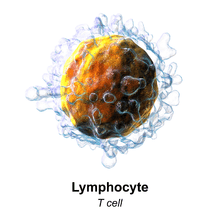 T cells can be distinguished from other lymphocytes, such as B cells and natural killer cells, by the presence of a T-cell receptor on the cell surface. They are called T cells because they mature in the thymus from thymocytes (although some also mature in the tonsils). The several subsets of T cells each have a distinct function. The majority of human T cells rearrange their alpha and beta chains on the cell receptor and are termed alpha beta T cells (αβ T cells) and are part of the adaptive immune system. Specialized gamma delta T cells, (a small minority of T cells in the human body, more frequent in ruminants), have invariant T cell receptors with limited diversity, that can effectively present antigens to other T cells and are considered to be part of the innate immune system. 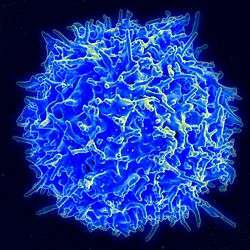 The category of effector T cell is a broad one that includes various T cell types that actively respond to a stimulus, such as co-stimulation. This includes helper, killer, regulatory, and potentially other T cell types. In this immunofluorescence image, a Cytotoxic T cell (blue) is engaging a target cell. A patch of signaling molecules (pink) that gathers at the site of cell-cell contact indicates that the CTL has identified a target. Lytic granules (red) that contain cytotoxic components then travel along the microtubule cytoskeleton (green) to the contact site and are secreted, thus killing the target. 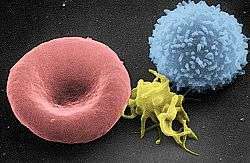 Memory T cells are a subset of antigen-specific T cells that persist long-term after an infection has resolved. They quickly expand to large numbers of effector T cells upon re-exposure to their cognate antigen, thus providing the immune system with "memory" against past infections. Memory cells may be either CD4+ or CD8+. Memory T cells typically express the cell surface protein CD45RO. resident memory T cells (TRM). Mucosal associated invariant T cells (MAITs) are a special type of T cell recognised since about 2009. All T cells originate from haematopoietic stem cells in the bone marrow. Haematopoietic progenitors (lymphoid progenitor cells) from haematopoietic stem cells populate the thymus and expand by cell division to generate a large population of immature thymocytes. The earliest thymocytes express neither CD4 nor CD8, and are therefore classed as double-negative (CD4−CD8−) cells. As they progress through their development, they become double-positive thymocytes (CD4+CD8+), and finally mature to single-positive (CD4+CD8− or CD4−CD8+) thymocytes that are then released from the thymus to peripheral tissues. Common lymphoid precursor cells that migrate to the thymus become known as T-cell precursors (or thymocytes) and do not express a T cell receptor. Broadly speaking, the double negative (DN) stage is focused on producing a functional β-chain whereas the double positive (DP) stage is focused on producing a functional α-chain, ultimately producing a functional αβ T cell receptor. As the developing thymocyte progresses through the four DN stages (DN1, DN2, DN3, and DN4), the T cell expresses an invariant α-chain but rearranges the β-chain locus. If the rearranged β-chain successfully pairs with the invariant α-chain, signals are produced which cease rearrangement of the β-chain (and silence the alternate allele) and result in proliferation of the cell. Although these signals require this pre-TCR at the cell surface, they are independent of ligand binding to the pre-TCR. 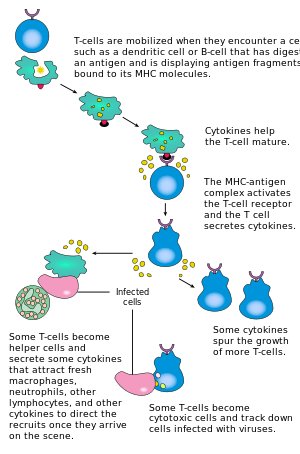 These thymocytes will then express both CD4 and CD8 and progresses to the double positive (DP) stage where selection of the α-chain takes place. If a rearranged β-chain does not lead to any signalling (e.g. as a result of an inability to pair with the invariant α-chain), the cell may die by neglect (lack of signalling). Double-positive thymocytes (CD4+/CD8+) move deep into the thymic cortex, where they are presented with self-antigens. These self-antigens are expressed by thymic cortical epithelial cells on MHC molecules on the surface of cortical epithelial cells. Only those thymocytes that interact with MHC-I or MHC-II appropriately (i.e., not too strongly or too weakly) will receive a vital "survival signal". All that cannot (i.e., if they do not interact strongly enough, or if they bind too strongly) will die by "death by neglect" (no survival signal). This process ensures that the selected T-cells will have an MHC affinity that can serve useful functions in the body (i.e., the cells must be able to interact with MHC and peptide complexes to effect immune responses). The vast majority of all thymocytes end up dying during this process. Negative selection removes thymocytes that are capable of strongly binding with "self" MHC peptides. Thymocytes that survive positive selection migrate towards the boundary of the cortex and medulla in the thymus. While in the medulla, they are again presented with a self-antigen presented on the MHC complex of medullary thymic epithelial cells (mTECs). mTECs must be AIRE+ to properly express self-antigens from all tissues of the body on their MHC class I peptides. Some mTECs are phagocytosed by thymic dendritic cells; this allows for presentation of self-antigens on MHC class II molecules (positively selected CD4+ cells must interact with MHC class II molecules, thus APCs, which possess MHC class II, must be present for CD4+ T-cell negative selection). Thymocytes that interact too strongly with the self-antigen receive an apoptotic signal that leads to cell death. However, some of these cells are selected to become Treg cells. The remaining cells exit the thymus as mature naïve T cells (also known as recent thymic emigrants). This process is an important component of central tolerance and serves to prevent the formation of self-reactive T cells that are capable of inducing autoimmune diseases in the host. In summary, β-selection is the first checkpoint, where the T cells that are able to form a functional pre-TCR with an invariant alpha chain and a functional beta chain are allowed to continue development in the thymus. Next, positive selection checks that T cells have successfully rearranged their TCRα locus and are capable of recognizing peptide-MHC complexes with appropriate affinity. Negative selection in the medulla then obliterates T cells that bind too strongly to self-antigens expressed on MHC molecules. These selection processes allow for tolerance of self by the immune system. Typical T-cells that leave the thymus (via the corticomedullarly junction) are self-restricted, self-tolerant, and singly positive. Activation of CD4+ T cells occurs through the simultaneous engagement of the T cell receptor and a co-stimulatory molecule (like CD28, or ICOS) on the T cell by the major histocompatibility complex (MHCII) peptide and co-stimulatory molecules on the APC. Both are required for production of an effective immune response; in the absence of co-stimulation, T-cell receptor signalling alone results in anergy. The signalling pathways downstream from co-stimulatory molecules usually engages the PI3K pathway generating PIP3 at the plasma membrane and recruiting PH domain containing signaling molecules like PDK1 that are essential for the activation of PKCθ, and eventual IL-2 production. Optimal CD8+ T cell response relies on CD4+ signalling. CD4+ cells are useful in the initial antigenic activation of naïve CD8 T cells, and sustaining memory CD8+ T cells in the aftermath of an acute infection. Therefore, activation of CD4+ T cells can be beneficial to the action of CD8+ T cells. The first signal is provided by binding of the T cell receptor to its cognate peptide presented on MHCII on an APC. MHCII is restricted to so-called professional antigen-presenting cells, like dendritic cells, B cells, and macrophages, to name a few. The peptides presented to CD8+ T cells by MHC class I molecules are 8–9 amino acids in length; the peptides presented to CD4+ cells by MHC class II molecules are longer, usually 12–25 amino acids in length, as the ends of the binding cleft of the MHC class II molecule are open. PLCγ can also initiate the NF-κB pathway. DAG activates PKCθ, which then phosphorylates CARMA1, causing it to unfold and function as a scaffold. The cytosolic domains bind an adapter BCL10 via CARD (Caspase activation and recruitment domains) domains; that then binds TRAF6, which is ubiquitinated at K63. :513–523 This form of ubiquitination does not lead to degradation of target proteins. Rather, it serves to recruit NEMO, IKKα and -β, and TAB1-2/ TAK1. TAK 1 phosphorylates IKK-β, which then phosphorylates IκB allowing for K48 ubiquitination: leads to proteosomal degradation. Rel A and p50 can then enter the nucleus and bind the NF-κB response element. This coupled with NFAT signaling allows for complete activation of the IL-2 gene. In spring 2014, the T-Cell Activation in Space (TCAS) experiment was launched to the International Space Station on the SpaceX CRS-3 mission to study how "deficiencies in the human immune system are affected by a microgravity environment"
In 2015, a team of researchers led by Dr. Alexander Marson at the University of California, San Francisco successfully edited the genome of human T cells using a Cas9 ribonucleoprotein delivery method. This advancement has potential for applications in treating "cancer immunotherapies and cell-based therapies for HIV, primary immune deficiencies, and autoimmune diseases". Causes of T cell deficiency include lymphocytopenia of T cells and/or defects on function of individual T cells. Complete insufficiency of T cell function can result from hereditary conditions such as severe combined immunodeficiency (SCID), Omenn syndrome, and Cartilage-hair hypoplasia. Causes of partial insufficiencies of T cell function include acquired immune deficiency syndrome (AIDS), and hereditary conditions such as DiGeorge syndrome (DGS), chromosomal breakage syndromes (CBSs), and B-cell and T-cell combined disorders such as ataxia telangiectasia (AT) and Wiskott-Aldrich syndrome (WAS). T-cell exhaustion is the progressive loss of T-cell function. It can occur during sepsis and after other acute or chronic infections. T-cell exhaustion is mediated by several inhibitory receptors including programmed cell death protein 1 (PD1), TIM3, and lymphocyte activation gene 3 protein (LAG3). ↑ McClory, Susan; Hughes, Tiffany; Freud, Aharon G.; Briercheck, Edward L.; Martin, Chelsea; Trimboli, Anthony J.; Yu, Jianhua; Zhang, Xiaoli; Leone, Gustavo (Apr 2012). "Evidence for a stepwise program of extrathymic T cell development within the human tonsil". The Journal of Clinical Investigation. 122 (4): 1403–1415. doi:10.1172/JCI46125. ISSN 1558-8238. PMC 3314444 . PMID 22378041. ↑ Vantourout, Pierre; Hayday, Adrian (Feb 2013). "Six-of-the-best: unique contributions of γδ T cells to immunology". Nature Reviews. Immunology. 13 (2): 88–100. doi:10.1038/nri3384. ISSN 1474-1741. PMC 3951794 . PMID 23348415. ↑ Gutcher I, Becher B (2007). "APC-derived cytokines and T cell polarization in autoimmune inflammation". J. Clin. Invest. 117 (5): 1119–27. doi:10.1172/JCI31720. PMC 1857272 . PMID 17476341. ↑ Akbar AN, Terry L, Timms A, Beverley PC, Janossy G (April 1988). "Loss of CD45R and gain of UCHL1 reactivity is a feature of primed T cells". J. Immunol. 140 (7): 2171–8. PMID 2965180. ↑ Willinger T, Freeman T, Hasegawa H, McMichael AJ, Callan MF (2005). "Molecular signatures distinguish human central memory from effector memory CD8 T cell subsets.". Journal of Immunology. 175 (9): 5895–903. doi:10.4049/jimmunol.175.9.5895. PMID 16237082. ↑ Shin, Haina; Iwasaki, Akiko (2013-09-01). "Tissue-resident memory T cells". Immunological Reviews. 255 (1): 165–181. doi:10.1111/imr.12087. ISSN 1600-065X. PMC 3748618 . PMID 23947354. ↑ Textbook of Medical Physiology by Guyton and Hall, edition 6, pg. 448, Suppressor T cells paragraph. ↑ Abbas AK, Benoist C, Bluestone JA, Campbell DJ, Ghosh S, Hori S, Jiang S, Kuchroo VK, Mathis D, Roncarolo MG, Rudensky A, Sakaguchi S, Shevach EM, Vignali DA, Ziegler SF (2013). "Regulatory T cells: recommendations to simplify the nomenclature". Nat. Immunol. 14 (4): 307–8. doi:10.1038/ni.2554. PMID 23507634. ↑ Singh B, Schwartz JA, Sandrock C, Bellemore SM, Nikoopour E (2013). "Modulation of autoimmune diseases by interleukin (IL)-17 producing regulatory T helper (Th17) cells". Indian J. Med. Res. 138 (5): 591–4. PMC 3928692 . PMID 24434314. ↑ Serriari NE, Eoche M, Lamotte L, Lion J, Fumery M, Marcelo P, Chatelain D, Barre A, Nguyen-Khac E, Lantz O, Dupas JL, Treiner E (2014). "Innate mucosal-associated invariant T (MAIT) cells are activated in inflammatory bowel diseases". Clin. Exp. Immunol. 176: 266–74. doi:10.1111/cei.12277. PMC 3992039 . PMID 24450998. ↑ Kjer-Nielsen L, Patel O, Corbett AJ, Le Nours J, Meehan B, Liu L, Bhati M, Chen Z, Kostenko L, Reantragoon R, Williamson NA, Purcell AW, Dudek NL, McConville MJ, O'Hair RA, Khairallah GN, Godfrey DI, Fairlie DP, Rossjohn J, McCluskey J (2012). "MR1 presents microbial vitamin B metabolites to MAIT cells". Nature. 491: 717–23. doi:10.1038/nature11605. PMID 23051753. ↑ Schwarz BA, Bhandoola A (February 2006). "Trafficking from the bone marrow to the thymus: a prerequisite for thymopoiesis". Immunol. Rev. 209: 47–57. doi:10.1111/j.0105-2896.2006.00350.x. PMID 16448533. ↑ Li QJ, Chau J, Ebert PJ, Sylvester G, Min H, Liu G, Braich R, Manoharan M, Soutschek J, Skare P, Klein LO, Davis MM, Chen CZ (2007). "miR-181a is an intrinsic modulator of T cell sensitivity and selection". Cell. 129 (1): 147–61. doi:10.1016/j.cell.2007.03.008. PMID 17382377. ↑ Haynes BF, Markert ML, Sempowski GD, Patel DD, Hale LP (2000). "The role of the thymus in immune reconstitution in aging, bone marrow transplantation, and HIV-1 infection". Annu. Rev. Immunol. 18: 529–60. doi:10.1146/annurev.immunol.18.1.529. PMID 10837068. ↑ Janeway, Charles (2012). Immunobiology. Garland Science. pp. 301–305. ISBN 9780815342434. ↑ Timothy K. Starr; Stephen C. Jameson; Hogquist, and Kristin A. (2003-01-01). "Positive and Negative Selection of T Cells". Annual Review of Immunology. 21 (1): 139–176. doi:10.1146/annurev.immunol.21.120601.141107. PMID 12414722. ↑ Zerrahn, Jens; Held, Werner; Raulet, David H. (1997-03-07). "The MHC Reactivity of the T Cell Repertoire Prior to Positive and Negative Selection". Cell. 88 (5): 627–636. doi:10.1016/S0092-8674(00)81905-4. ISSN 0092-8674. PMID 9054502. ↑ Hinterberger M, Aichinger M, Prazeres da Costa O, Voehringer D, Hoffmann R, Klein L (June 2010). "Autonomous role of medullary thymic epithelial cells in central CD4(+) T cell tolerance". Nat. Immunol. 11 (6): 512–9. doi:10.1038/ni.1874. PMID 20431619. ↑ The NIAID resource booklet "Understanding the Immune System (pdf)". ↑ Williams, Matthew A.; Bevan, Michael J. (2007-01-01). "Effector and Memory CTL Differentiation". Annual Review of Immunology. 25 (1): 171–192. doi:10.1146/annurev.immunol.25.022106.141548. PMID 17129182. ↑ Janssen, Edith M.; Lemmens, Edward E.; Wolfe, Tom; Christen, Urs; von Herrath, Matthias G.; Schoenberger, Stephen P. (2003-02-20). "CD4+ T cells are required for secondary expansion and memory in CD8+ T lymphocytes". Nature. 421 (6925): 852–856. doi:10.1038/nature01441. ISSN 0028-0836. ↑ Shedlock, Devon J.; Shen, Hao (2003-04-11). "Requirement for CD4 T Cell Help in Generating Functional CD8 T Cell Memory". Science. 300 (5617): 337–339. doi:10.1126/science.1082305. ISSN 0036-8075. PMID 12690201. ↑ Sun, Joseph C.; Williams, Matthew A.; Bevan, Michael J. (2004-09-01). "CD4+ T cells are required for the maintenance, not programming, of memory CD8+ T cells after acute infection". Nature Immunology. 5 (9): 927–933. doi:10.1038/ni1105. ISSN 1529-2908. PMC 2776074 . PMID 15300249. 1 2 Tatham P, Gomperts BD, Kramer IM (2003). Signal transduction. Amsterdam: Elsevier Academic Press. ISBN 0-12-289632-7. ↑ Wu H, Arron JR (November 2003). "TRAF6, a molecular bridge spanning adaptive immunity, innate immunity and osteoimmunology". BioEssays. 25 (11): 1096–105. doi:10.1002/bies.10352. PMID 14579250. ↑ Milstein O, Hagin D, Lask A, Reich-Zeliger S, Shezen E, Ophir E, Eidelstein Y, Afik R, Antebi YE, Dustin ML, Reisner Y (January 2011). "CTLs respond with activation and granule secretion when serving as targets for T-cell recognition". Blood. 117 (3): 1042–52. doi:10.1182/blood-2010-05-283770. PMC 3035066 . PMID 21045195. ↑ Graham, William (2014-04-14). "SpaceX ready for CRS-3 Dragon launch and new milestones". NASAspaceflight.com. Retrieved 2014-04-14. 1 2 Feinerman O, Germain RN, Altan-Bonnet G (2008). "Quantitative challenges in understanding ligand discrimination by alphabeta T cells". Mol. Immunol. 45 (3): 619–31. doi:10.1016/j.molimm.2007.03.028. PMC 2131735 . PMID 17825415. ↑ Dushek O, van der Merwe PA (2014). "An induced rebinding model of antigen discrimination". Trends Immunol. 35 (4): 153–8. doi:10.1016/j.it.2014.02.002. PMC 3989030 . PMID 24636916. 1 2 Schumann, Kathrin; Lin, Steven; Boyer, Eric; Simeonov, Dimitre R.; Subramaniam, Meena; Gate, Rachel E.; Haliburton, Genevieve E.; Ye, Chun J.; Bluestone, Jeffrey A. (2015-08-18). "Generation of knock-in primary human T cells using Cas9 ribonucleoproteins". Proceedings of the National Academy of Sciences of the United States of America. 112 (33): 10437–10442. doi:10.1073/pnas.1512503112. ISSN 1091-6490. PMC 4547290 . PMID 26216948. 1 2 Jones J, Bannister BA, Gillespie SH, eds. (2006). Infection: Microbiology and Management. Wiley-Blackwell. p. 435. ISBN 1-4051-2665-5. ↑ "The Lymphomas" (PDF). The Leukemia & Lymphoma Society. May 2006. p. 2. Retrieved 2008-04-07.